Do you want a tablet with a keyboard or a mid-sized iOS device? Microsoft Surface: the tablet that can also be a laptop. Not everyone loves them, but it seems that, as far as the big technology guns are concerned, tablets are very much where it's at right now. We've just had a couple of significant announcements from two of the major players. 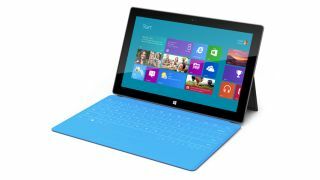 First up, Microsoft has revealed that prices for its range of Surface tablets will start at £399/$499. This will get you a 32GB Windows RT model, though you'll have to pay an extra £100 for one of the touch keyboard covers. A Type Cover physical keyboard, meanwhile, will set you back £110. Pre-orders are now being taken on the Microsoft Surface site. The tablet will go on sale on 26 October. Over at Apple, it seems pretty certain that the much-rumoured iPad mini will be launched on October 23. Invites for a press event have been sent out with the words "We've got a little more to show you" printed on them. There are also rumours of a 13-inch MacBook Pro with a Retina display and possibly even a new iMac.